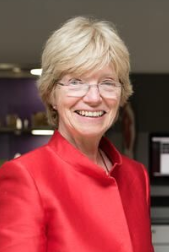 Professor Susan Margaret Standring presented her Semon Lecture on the 7th of November 2014 at the Royal Society of Medicine. Although the lecture available here is not the exact one given, the content is very similar without as much specialist ENT history as was in the lecture. Her lecture looks at the history of anatomy and the part that dissection has played through the ages. It starts by exploring the effect of the Egyptian medical papyri and ends with the effects that new technologies have had on our anatomical understanding and skills. Standring placed particular emphasis on discoveries related to the larynx, all the way from Galen to the modern era of videolaryngoscopy. Susan Standring was born in February 1947 in England. In contrast to most Semon Lecturers, Standring is a neuroscientist and anatomist rather than a doctor or surgeon. She rose to fame as Editor-in-Chief of Gray’s Anatomy, although she has published more than 150 articles and numerous book chapters as well. Standring has also previously been appointed as President of the Peripheral Nerve Society and of the Anatomical Society, and elected as an Honorary Fellow of the Royal College of Surgeons of England.